The gene Polymorphic derived intron-containing, known as Pldi, is a long non-coding RNA (lncRNA) first discovered in mouse. Although parts of its sequence were reported to be conserved in rat and human, it can only be expressed in mouse testis with a mouse-specific transcription start site. The consensus sequence of Pldi is also part of an antisense transcript AK158810 expressed in a wide range of mouse tissues. We focused on sequence origin of Pldi and Ak158810. We demonstrated that their sequence was originated from an inter-genic region and is only presented in mammalians. Transposable events and chromosome rearrangements were involved in the evolution of ancestral sequence. Moreover, we discovered high conservation in part of this region was correlated with chromosome rearrangements, CpG demethylation and transcriptional factor binding motif. These results demonstrated that multiple factors contributed to the sequence origin of Pldi. We comprehensively analyzed the sequence origin of Pldi-Ak158810 loci. We provided various factors, including rearrangement, transposable elements, contributed to the formation of the sequence. Although pervasively transcribed, only 5%-10% of the human genome is covered by mRNA and spliced non-coding RNAs, and the majority of which does not encode proteins . Long non-coding RNAs (lncRNAs) are defined as transcribed non-coding RNA larger than 200 nt in length, which plays an essential role in regulating gene expression, chromatin functions . As lncRNAs act as biological building blocks, it is necessary to understand the process of developing new lncRNA genes . The emergence of a functional lncRNA gene could be summarized into various evolutionary scenarios, including metamorphosis of a protein coding gene, derived from a genomic region previously devoid of exonic sequence, duplication by retro-transposition, and emergence following tandem duplication or insertion of transposable elements [1, 4]. For most of the scenarios, comprehensive studies have been established on specific lncRNA genes with well-known functions, such as XIST, HOTAIR [5, 6]. However, little was known about developing a new lncRNA gene from a non transcribed genomic region. The mechanism of the de novo origin of a lncRNA gene remains to be clarified. Previous study on de novo protein has accounted for that those seemingly dispensable sequences in non-genic regions could generate adaptive functional proteins through evolution. The de novo birth and development of a potential protein coding gene is in line with increasing open reading frame (ORF) length and conservation through the natural selection benefited from random translation on genome [3, 7, 8]. Like proteins, the occasional transcription and changing events in non-genic sequences could provide raw material generating de novo lncRNAs . Here, we focused on the sequence origin of a lncRNA in an intergenic region, demonstrating its sequence components and changes within species. Pldi gene was previously identified and defined as an intergenic originated lncRNA gene, which is overlapped with a putative opposite-strand transcript, AK158810 (Additional File 1). Pldi locates within a 200 kb region that is free of annotated transcripts or expressed sequence tags (ESTs) in rat and humans, which raise the possibility of de novo emergence of the Pldi-AK158810 loci (about 20 kbps-long). Knocking out Pldi would reduce sperm motility and testis weight, indicating that Pldi has the ability in regulating the expression levels of other genes in testis . Numerous functional non-coding RNAs have been demonstrated to regulate gene expressions through an antisense mechanism, playing an important role of gene overlapping in non-coding RNA functions [11–13]. On the contrary, few studies discussed the origin of overlapping non-coding RNAs due to lacking of clear markers, like ORF in protein. In this study, we conducted a comprehensive analysis on the sequence origin of mouse Pldi-Ak158810 loci. We evaluated various factors that contribute to the origin, and gave adequate evidence to prove the de novo origin of this loci. Moreover, we found that Pldi-Ak158810 established its fixation from a specific overlapping region some time before emergence. We further discussed the potential role of the local element in the evolution and fixation of this orphan lncRNA gene loci. The 13 genomes of vertebrates used in this study were downloaded from UCSC genome database http://hgdownload.soe.ucsc.edu/downloads.html. Genome versions of these 13 genomes are in Additional File 2. The sequence of Pldi-Ak158810 loci was picked from mouse (GRCm 38) export data in Ensembl http://www.ensembl.org. We used nucleotide Blast (Basic Local Alignment Search Tool) to detect homology between Pldi-Ak158810 nucleotide sequence and vertebrate genomes, a cutoff for identity was set at 80%. Protein Blast was used to find protein coding genes homologue to the genes flanking with Pldi and Ak15880. ClustalW http://www.clustal.org/download/current/ was used to align protein and nucleotide sequences . MEGA5.1 was used to construct neighbor-joining phylogenic tree . The genomic alignment of 30 vertebrates by MultiZ was downloaded from UCSC [17, 18]. All genomes were mapped to the mouse chromosomes. 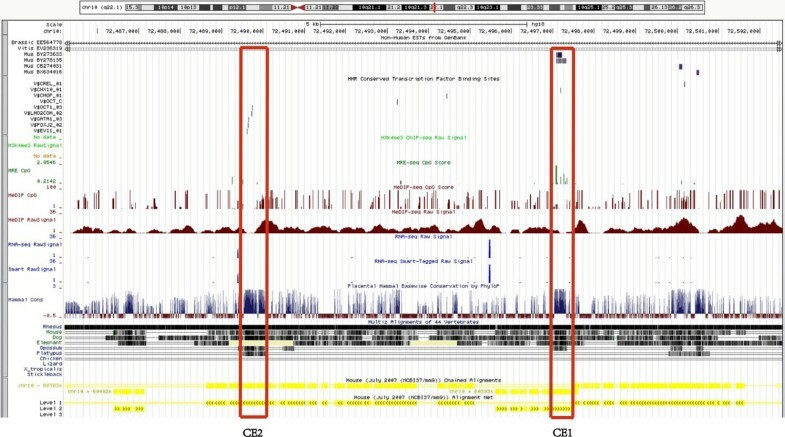 Repeats and transposable elements were annotated by Repeatmasker program. Sequences of Pldi-Ak158810 were submitted to the Repeatmasker website http://www.repeatmasker.org version 4.0.1, which uses default parameters. The repeat class were transformed and grouped as SINE, LINE, DNA, LTR and others. In the analysis of ancient transposable elements, we did not include simple repeats and low complexity sequences . Assumptions of the model. We used surrounding gene exons as reference. We assumed the substitution rate relative to those exons would not change too much if no selection pressures affect this region. For test sequence, we defined three constant substitution rates on the species tree, to test the rate change at two time point: inversion and emergence of Pldi-Ak158810 transcription. (a) Red lines represent for substitutions after gene birth, at rate r2; green lines represent for substitutions after two observed inversion, and before gene birth, at rate r1; black lines represent for substitutions before inversion, at rate r0. We were concerned about the rate change relative to surrounding gene exons, all the rates were normalized by the variable reference rate rR. (b-d) raverXY were calculated by dividing test sequence XY distance by reference XY distance, which indicates a relative substitution rate on the bold path; three raverXY will be similar if substitution rates do not vary significantly in three stages. where dtestHD, dtestHR, dtestMR are the genetic distance of the test sequences between human and dog, human and rat, mouse and rat, respectively, tHD, tHR, tMR represent for the divergent time between each pair of species. where dRefHD, dRefHR, and dRefMR are the genetic distance of the reference exon sequences between human and dog, human and rat, mouse and rat. where 0 < k1, k2 <1. raverHD, raverHR and raverMR are the average substitution rates at different stages. If raverHR <(>) raverHR , we get r0<(>) r1. Similarly, a reduced r2 will produce a lower raverMR, as the only envolving path affected by r2. We used ClustalW to realign the conserved elements in Pldi-Ak158810 and exons of surrounding four genes, manually remove sites with low similarity by Bioedit http://www.mbio.ncsu.edu/bioedit/bioedit.html. All the four genes were merged into one single alignment. Then a Maximum Likelihood (ML) tree and distance matrix was estimated by PAML 4.6 baseml for each alignment) . We collected two sources of methylation data as a comparison, one is from mouse tissue, the other is from human ENCODE data. The probability of methylation was estimated with both methylated and unmethylated fragment information (Additional File 3) . Demethylation data from human UCSF brain methylation database viewed with UCSC genome browser was implemented to detect the DNA methylation in the human homologue region of Pldi-Ak158810 loci, which was displaced in Additional file 3. RNA-seq data is from Encode Cold Spring Harbor Lab (CSHL) RNA-seq, and there are 5 types of tissues included (heart, kidney, ovary, spleen and testis). We viewed this data using UCSC genome browser . Human, Mouse, Rat (HMR) Conserved Transcriptional Factor Binding Site (TFBS) was implemented to displace the potential binding sites of these two highly conserved regions . We studied the emergence time of Pldi and Ak158810. Pldi locates in an inter-genic region free of any human and rat EST signals, indicating that Pldi and its antisense putative gene generating Ak158810 were not transcribed before the divergence of rodents. In mouse lineages, RNA transcript of Pldi has been discovered . To validate the transcript Ak158810, we compared its 2.9 kb sequence with mouse EST database from NCBI. The result confirmed the transcription of Pldi antisense strand, and EST hits matched with splicing of the first and second exons of Ak158810 (Additional File 4). We further analyzed the open reading frames (ORFs) in Ak158810 RNA, The longest ORF is shorter than 110 amino acids. (Two AUG codons with shorter reading frames ~70 amino acids preceded this long ORF) (Additional File 5). It indicates that Ak158810 is not likely to encode proteins. Our results, along with previous knowledge , showed that the Pldi and Ak158810 are two mouse-specific lncRNAs located on anti-sense strand to each other. 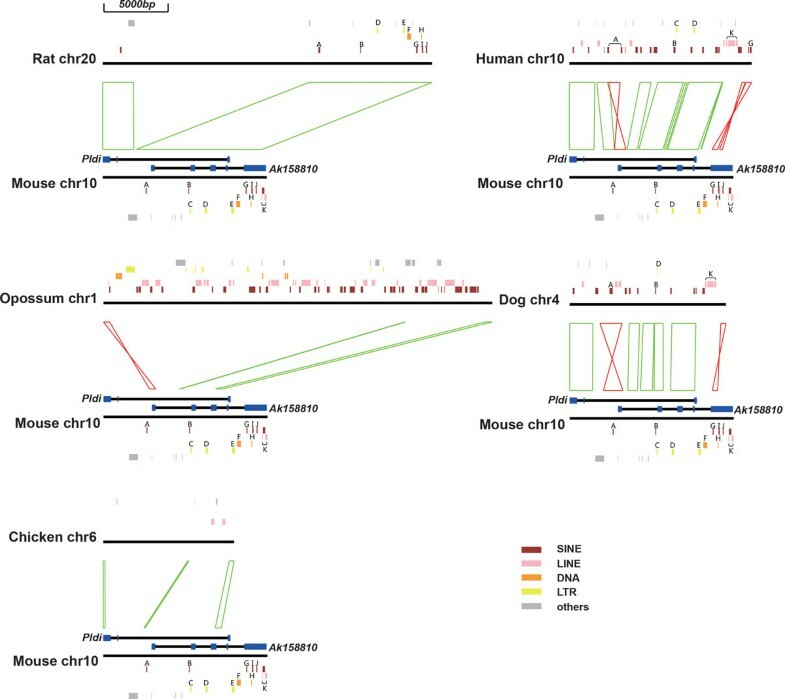 These evidences suggest that Pldi, and its putative antisense lncRNA, Ak158810, were first transcribed at similar time between the divergence of mouse and rat. To study the evolution of Pldi-Ak158810 loci, we searched for homologues of Pldi and Ak158810 loci in 13 vertebrates. First, homologs of Pldi-Ak158810 sequence were found in all mammals by using Blastn. Except a transposable element in rat and mouse, all the homologs are between the region of unc5b and pcbd1 in mammalian classes. It demonstrates that parts of Pldi-Ak158810 loci were already present in the mammalian cen-ancestor. Meanwhile, we failed to detect significant sequence similarity to Pldi-Ak158810 loci in non-mammalian vertebrates with Blastn (Figure 2 & Additional File 6). Phylogenetic distribution of Pldi-Ak158810 loci and its surrounding genes within vertebrate species. The phylogenetic tree of 13 vertebrates was adapted from a widely accepted tree topology [5, 32]. The branch length does not represent the distance between each species and no molecular clock model was assumed. Different gene highlighted with marks of different colors. We could find the hits from Blastn in all mammals, whereas no hits in non-mammalian species. We could observe that all these 4 flanking protein are ordered laid around the Pldi-Ak158810 loci. In contrast, in non-mammalian species, some big gaps (larger than the average distance ~200 kb in mammals) inserted into the 4 flanking protein region, which made the order of the 4 proteins changed. The gap in Xenopus might due to the incomplete genomic description. Result of Blastn could be found in Additional File 6. Clustering paralogues and orthologues of 4 flanking proteins. We used clustering to identify the paralogues and orthologues of the 4 flanking proteins (a: slc29a3, b: unc5b, c: pcbd1, d: sgpl1) in 4 species (mouse, rat, human and chicken). The result beyond indicates these Pldi-Ak158810 loci surrounding regions linkaged in these 4 species and these 4 flanking genes have been free from duplication of their paralogues since the time of their cen-ancestor. Sgpl1 doesn't contain a paralogue and it has the same topological structure as the other genes. 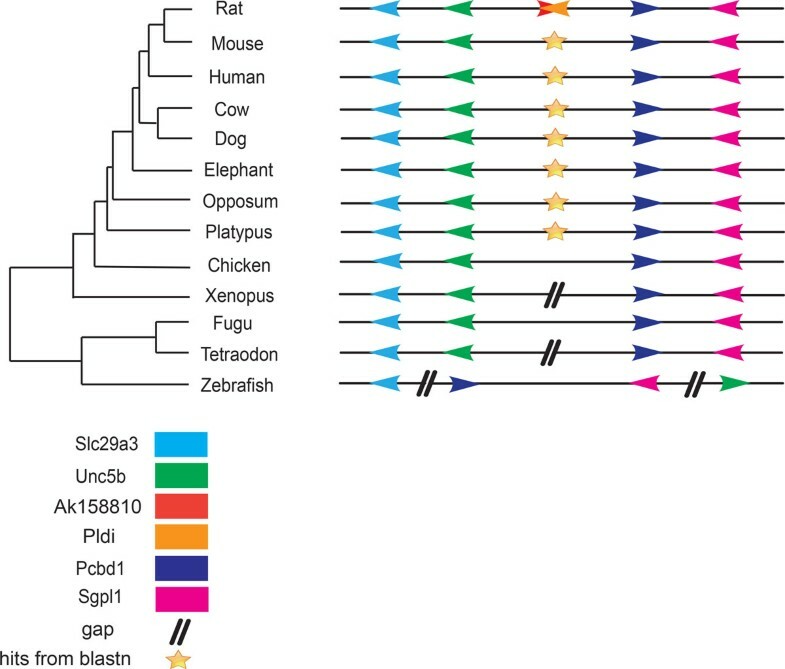 Based on the exons and introns of Pldi and Ak158810, we further analyzed the origin of them in mouse, rat, human, dog, opossum and chicken (Figure 4 & Figure 5). Pldi consists of 3 exons and 2 introns, and Ak158810 consists of 5 exons and 4 introns. In non-rodent species, two fragments in intron 1 of Pldi were detected. Then, we used MultiZ alignment to compare Pldi and its homologues regions in mouse, rat, human, dog, chicken and opossum. We discovered that the majority of the mouse Pldi-Ak158810 region could be aligned to rat, human, and dog, including exons and introns. In opossum, no fragment was mapped to the three Pldi exons. Ak158810 exon 1 and part of exon 3 are covered by opossum homologues, matching with the conserved elements detected by our previous analysis (Figure 2). In chicken, few homologue was detected, except partial Ak158810 exon 3. Alignment of mouse and other five species (rat, human, dog, opossum, chicken): Positions of transposable elements at Pldi-Ak158810 loci. The linkages between two chromosome fragments mean one or a few adjacent blocks in the alignment, and red ones mean inversion. Various class of transposable elements are plot in five colors. SINE, short interspersed nuclear elements; LINE, long interspersed nuclear elements; DNA, DNA repeat elements; LTR, long terminal repeat elements, including retroposons; Others, other types of repeat sequences, including simple repeat, sequences with low complexity. 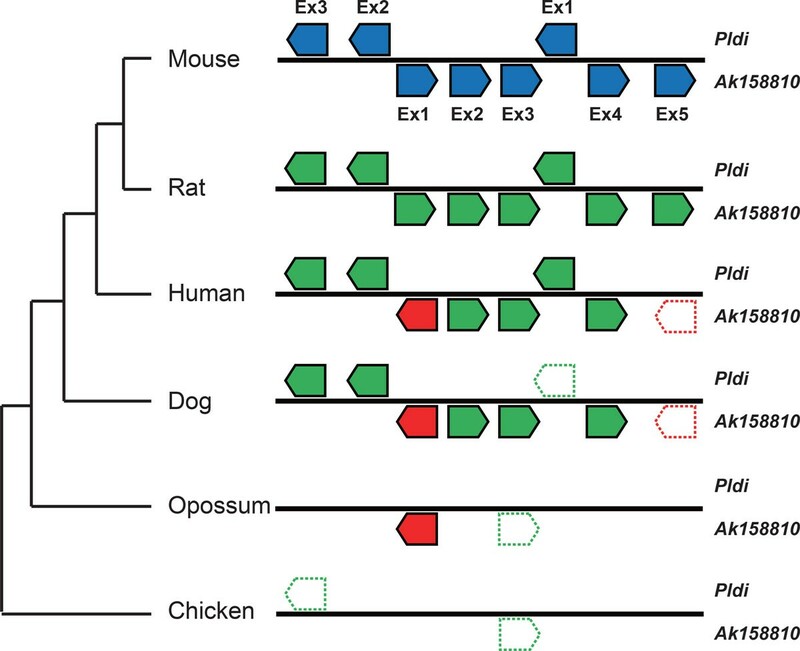 Transposable elements exist in at least two species including mouse were annotated with character A-K. Formation of Pldi-Ak158810 exon sequences. Green pentagons represent for homologue sequences match with specific mouse exons, red ones represent for inversed exons. Pentagons in bold lines suggest homologues with low similarity or low percent of coverage. The sequence alignment also revealed that were involved in the evolution of Pldi region. We identified two inversions at the loci. First one is the inversion of a ~800 bps fragment, containing the first exon of Ak158810 (Figure 5 & Addition File 1). Another inversion is overlapped with Ak158810 exon 5. 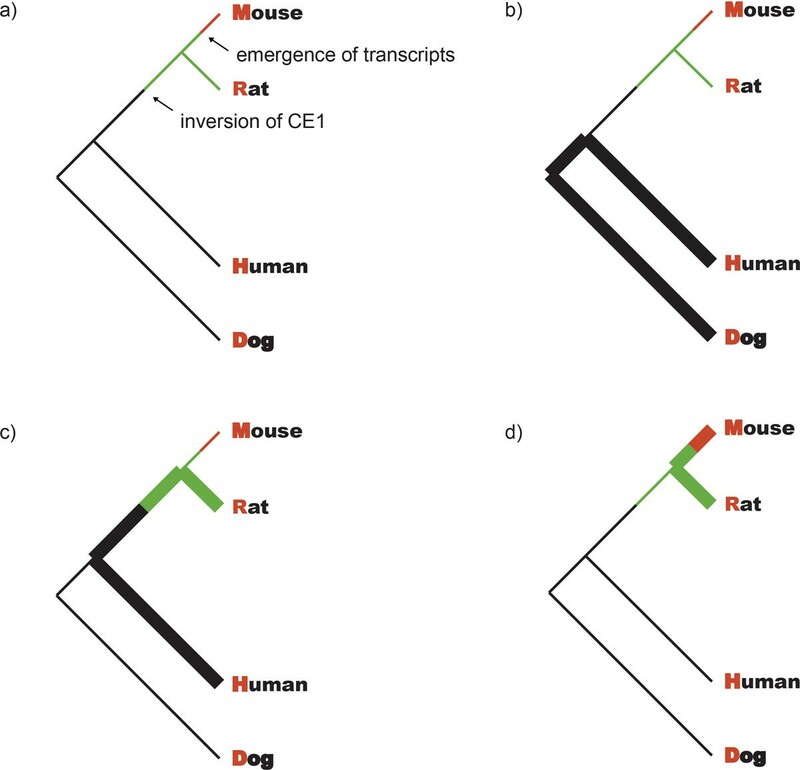 The regions, homologue to the two inversed fragments of non-rodent mammalians, are in opposite direction to those of mouse, which reveals both inversions occurred before the divergence of mouse and rat, and after the divergence of primates and rodents. Interestingly, the first inversed region is highly conserved, which is discussed in following section. Transposable elements (TEs) have been considered as an important composition in the genome , we then evaluated the contribution of transposons to the formation of Pldi-Ak158810 loci. We compared the sequence of mouse Pldi-Ak158810 loci and homologous sequences in other 5 species (rat, human, dog, opossum and chicken) with the database of mobile elements, using RepeatMasker program .To understand whether Pldi-Ak158810 loci is interrupted by ancient TEs, we manually checked and listed the eleven TEs, which exist in at least two species including mouse (Table 1). No TE was found in opossum and chicken, possibly because of the low homology between this two species and mouse. Transposable elements (TEs) that contributed to the formation of ancestral Pldi-Ak158810 sequences. Only TEs in at least 2 species including mouse are listed. SINE, short interspersed nuclear elements; LINE, long interspersed nuclear elements; DNA, DNA repeat elements; LTR, long terminal repeat elements, including retroposons. In Pldi exon 1 to 3 and Ak158810 exon 1 to 4, no ancient TE was detected. However, almost half of all the defined ancient TEs locate in Ak158810 exon 5 (Table 2 & Figure 4). Inside the longest Pldi intron 1, four ancient TEs were identified, three of which also locate in the overlapped Ak158810 intron region (Table 2 & Figure 4). The data shows no evidence that insertions of TEs have been involved in most of the exons at the loci during recent period of time, except for Ak158810 exon 5. The formation of the last exon of Ak158810 and intron sequences of both Pldi and Ak158810 are associated with various types of transposable events. A, B, C, D, E, F, G, H, I, J, K represent different TE used in Table 1. 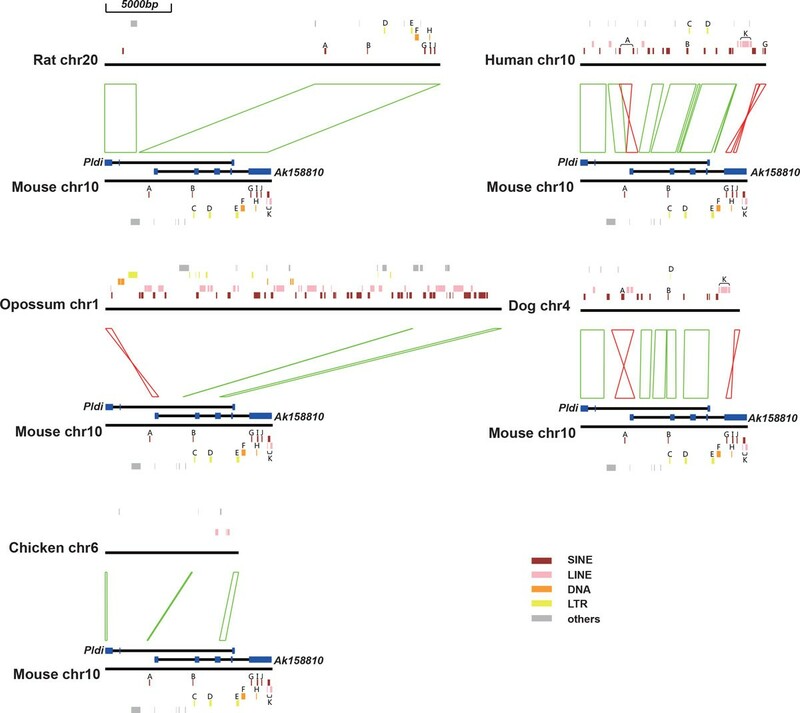 From genomic sequence in mammals, we noticed the Pldi-Ak158810 loci was interrupted by chromosome rearrangement in a period of time before its emergence in mouse lineage. Interestingly, one of the rearranged fragments associated with Ak158810 exon 1 is highly conserved among species. From this point of view, we estimated the substitution rate of this highly conserved region among species to test whether inversion contribute to fixation of local region. To better learn the evolution of this loci, we examined the change in substitution rate during the fixation of 4 species, mouse, rat, human and dog. Taking the exon sequences of flanking genes (pcbd1, slc29a3, sgpl1, unc5b) as a reference, we constructed a simple model to test the rate change at two time points: the point of chromosome rearrangement and the emergence of Pldi and Ak158810 in mouse lineage (Figure 5). We extracted sequences of two conserved elements (CE1, conserved element 1 in the inversion; CE2, conserved element 2 near Ak158810 exon 3), which could be detected by Blastn in distant organisms. Compared with surrounding genes (Additional File 7 & Table 3), both CE1 and CE2 obtain the lowest normalized rates during mouse-rat divergence, in line with result from a previous study that purifying selection is acting on Pldi region after its emergence . Furthermore, for CE1, the average rate of human-dog divergence is higher than that of human-rat, which implies the substitution rate of this element was slightly reduced after rearrangement. For CE2, not involved in rearranged regions, the tendency is opposite. The data shows the possibility that the specific elements of the Pldi-Ak158810 loci established their fixation at an early time before the gene birth. Inversion of CE1 may contribute to its acquisition of purifying selection, causing a slightly reduced substitution rate. A simplified model to test the change of substitution rate at two time point: occurrence of the inversion and emergence of Pldi and Ak158810 gene. Normalized average substitution rates during specific lineage (e.g. "HD" stands for human and dog) are calculated. A new lncRNA gene could emerge through different scenarios, such as metamorphosis from a protein-coding gene, interrupted by tandem repeat and transposable elements, and de novo origin from an intergenic region. Our analysis further confirmed the inter-genic origin of Pldi-Ak158810 sequence without any clues of long genomic duplication in a recent past. Tracing back in history, both transposable events and chromosome rearrangements were found in the region. In conclusion, the formation of the Pldi-Ak158810 loci, which became a pair of lncRNA genes in mouse lineage, was affected by multiple factors. A previous study indicates that the conservation of non-coding RNA is only slightly higher than that of inter-genic region . In Pldi region, reduced polymorphism has been detected in specific mouse lineage, which suggests the present of purifying selection. Nevertheless, we found in our data that partial Pldi-Ak158810 sequence is conserved in all mammalians. It raises the possibility that purifying selection may be acquired in partial Pldi-Ak158810 region much earlier than the gene birth. We checked factors that could be responsible to the early fixation. Our calculation of substitution rate change shows that the inversed Ak158810 exon 1 was prone to decreasing the evolutional ability after inversion event, relative to surrounding genes (Table 3 & Additional File 7). This trend may represent for an increasing natural selection [25–27]. We also checked DNA modification of the region in human. A series significant signals of demethylation in CpGs are highly correlated with the conserved inversed element, CE1 (Figure 6 & Additional File 3) using Encode browser , CE1 is overlapped with the promoter region of Pldi 's antisense gene, Ak158810, and the promoter sequence in mouse was found with low DNA methylations . Furthermore, from the transcription factor binding site conserved tracks in UCSC, we find this CE1 homologue site is a potential transcription factor binding site of Chx10 conserved in both human and mouse (Figure 6) . This binding site exists both in human and mouse. The demethylation signals and predicted TFBS found in human imply a transcribe tendency in these area. A strong DNA demethylation signal (green) was found in CE1 region. The HMR conserved TFBS displayed that each black line represents one conserved putative TFBS, which is conserved in human/mouse/rat alignment. The red rectangle demonstrated the consistence of CE1 with potential function signals, like demethylation, TFBS (black) and inversion (yellow arrow direction). According to these observations, we suggested in species other than mouse, partial region of Pldi-Ak158810 loci could not be simply recognized as "non-functional" before the birth of Pldi. It has been known that two neighboring genes may form a transcriptional unit , which is correlated with expression. As for this case, we assumed the earlier developed lncRNA might influence the birth of the other one by expression level. We attempted to detect the birth order of AK158810 and Pldi, According to previous studies, the birth order of Ak158810 and Pldi may not quite clear for the following reasons: first, testis where Pldi was born has been considered as an important organ for the emergence of a novel gene [4, 29]. According to RNA-seq data (CSHL) and previous study, Pldi is a testis-specific lncRNA, while Ak158810 is likely to have a wide expression range, such as heart, spleen and kidney (Additional File 8). That indicates that Ak158810 seems to be a not that young gene as Pldi [4, 30]; Second, considering northern blot experiment, Pldi exists in more species or lineages in mouse testis [10, 31], inferring that it is more likely to be older than Ak158810. The conflict result, together with the phenomenon, that the expressions of both lncRNAs are limited in mouse, demonstrated that AK158810 and Pldi were newly transcribed lncRNAs in a similar age after the divergence of mouse and rat. In this study, we comprehensively analyzed the sequence origin of a lncRNA antisense gene pair, Pldi-Ak158810. We found out various factors, including rearrangement, transposable elements, contributed to the formation of the sequence. We also figured out partial sequence of the entire loci is highly conserved in mammalians before the birth and provided evidences and correlated factors for the early fixation of conserved elements. Yulin Dai, Shengdi Li contributed equally to this work. We thank Prof. Lei Liu, Dr. Guangyong Zheng, Dr. Zhen Wang, Jie Wang, and Tiancheng Liu, for their helpful comments and suggestions. This work was supported by the National Key Basic Research Program of China, known as 973 Program (grant number: 2011CB910204, grant number: 2010CB529206, grant number: 2010CB912702), the Research Program of The Chinese Academy of Sciences (grant number: KSCX2-EW-R-04, grant number: KSCX2-YW-R-190, grant number: 2011KIP204) and National Natural Science Foundation of China (grant number: 31070752). Funding for the publication fee comes from National Natural Science Foundation of China (grant number: 31070752). This article has been published as part of BMC Genomics Volume 14 Supplement 8, 2013: Selected articles from the International Conference on Intelligent Biology and Medicine (ICIBM 2013): Genomics. The full contents of the supplement are available online at http://www.biomedcentral.com/bmcgenomics/supplements/14/S8. YL.D., SD.L., X.D., H.S., C.L., Z.L. and BL.Y. carried out all the analysis in this study. X.D. conceived of the study. YL.D., SD.L., X.D., GH.D. and YX.L. wrote the manuscript. All authors read and approved the final manuscript.